Despite slumping sales in the United States during 2016, motorcycles are having a moment. According to a recent article in the “New Yorker,” a number of Silicon Valley plutocrats have made motorcycles key components of their preparations for Armageddon, be it biblical, biological, radiological, climatological, or the result of good-old-fashioned populist rage. These well-heeled survivalists have figured out that when the end times come and the freeways clog with Teslas and Priuses heading for the hills, a motorcycle might be the only way to get out of town alive. In this grim scenario, the motorcycle is the killer app, enabling digital disruptors and their spouses clutching them tight to zigzag through even the worst “Road Warrior” landscapes to the safety of their heavily armed and copiously stocked bunkers, located precisely a gas tank of fuel away (“Good luck, kids!”). As two-wheeled vehicles designed primarily for single riders, motorcycles have long been symbols of independence, freedom, and escape, but they haven’t always been so directly aligned with unbridled selfishness. In fact, motorcyclists are preternaturally social creatures, whose communities run the gamut from the local chapter of Hells Angels revving their roaring Harleys to a group of senior citizens taking their purring Gold Wings out for a Sunday ride. Steve McQueen (1930-1980) belonged to neither of these clans, but according to McQueen’s Motorcycles: Racing and Riding with the King of Cool, written by former “Motor Trend” executive editor Matt Stone, McQueen loved motorcycles for their sense of community. Oh sure, McQueen rode Triumphs and Huskys hard for the thrill of going crazy fast, but he was also into bikes to bask in the bonhomie of like-minded motorheads. Top: Steve McQueen on his Norton Commando during the filming of “Le Mans” in 1970. McQueen family photo. 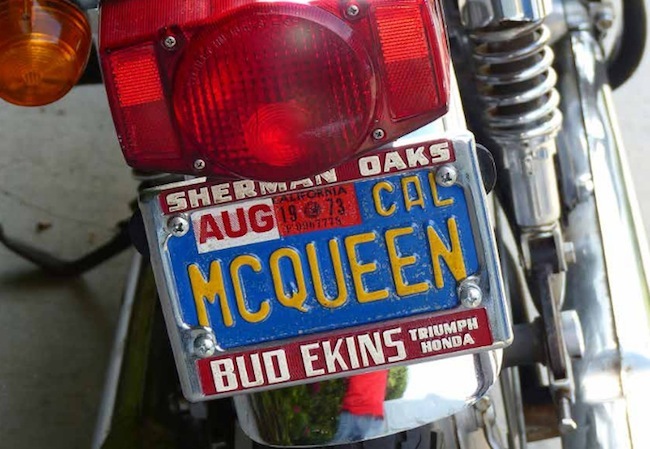 Above: It doesn’t get cooler than a Bud Ekins frame around a personalized McQueen license plate. Photo by Matt Stone. Both images from McQueen’s Motorcycles. The two most important motorheads in McQueen’s cycling circle were the brothers Dave and Bud Ekins, the latter of whom owned a Triumph and Honda dealership in Sherman Oaks, California, not too far from McQueen’s home in the Hollywood Hills. “Those guys were brothers to him, and vice versa,” Stone told me when we spoke recently over the phone. When McQueen met the Ekins brothers, he was a rising star, an actor who had made a name for himself in “The Magnificent Seven” but was not yet world famous for the role he would shortly play as the motorcycle-riding prisoner of war in “The Great Escape” (1963). The Ekins shop was perfect for a guy like Steve McQueen, who as a 12-year-old had helped a friend put a Ford V8 engine into an Allard J2 roadster, and as a 17-year-old in the Marine Corps had even tried to soup up one of his company’s tanks to see if he could get it to go any faster. For the record, it could not because, well, it was a tank. This is probably a publicity shot, taken in 1961, of McQueen posing on a Honda CA77 Dream. Photo by PhotoFest, from McQueen’s Motorcycles. In hindsight, it seems almost inevitable that Steve McQueen would find his way to the Ekins motorcycle dealership. Like McQueen, Bud was born in 1930, and spent time as a teenager in a reform school. In addition, the Ekins brothers were racers—McQueen almost chose a career as a race-car driver before an ultimatum from McQueen’s movie studio, United Artists, forced him to pursue acting full time. And most important of all, the Ekins brothers and the mechanics who worked in Bud’s shop lived and breathed bikes. McQueen did, too, which was more important to all concerned than McQueen’s glamorous day job. 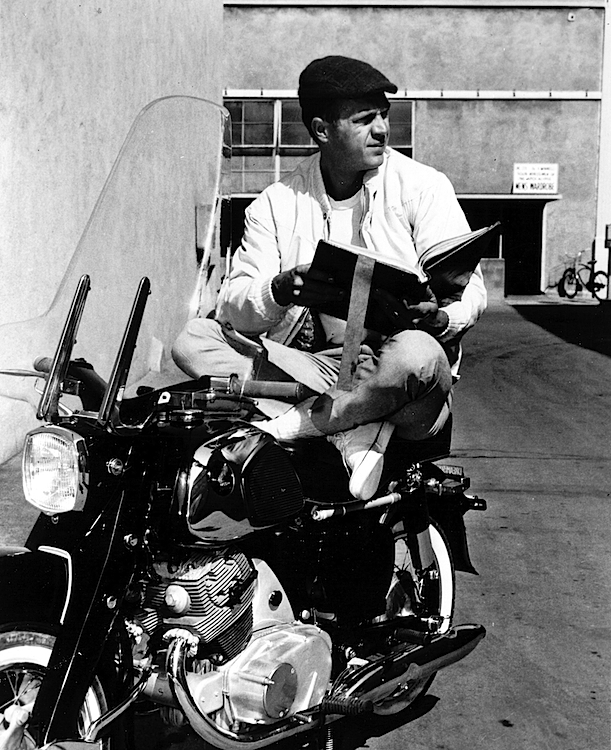 “Bud was not especially impressed with the Hollywood scene,” Dave Ekins writes in his foreword to McQueen’s Motorcycles, “so it was easy for celebrities to come and go as they pleased without any special attention brought to them.” For McQueen, the Ekins dealership became an escape from the pressures of celebrity, a home away from home where he didn’t have to hide behind a pair of Persol sunglasses in order to be cool. 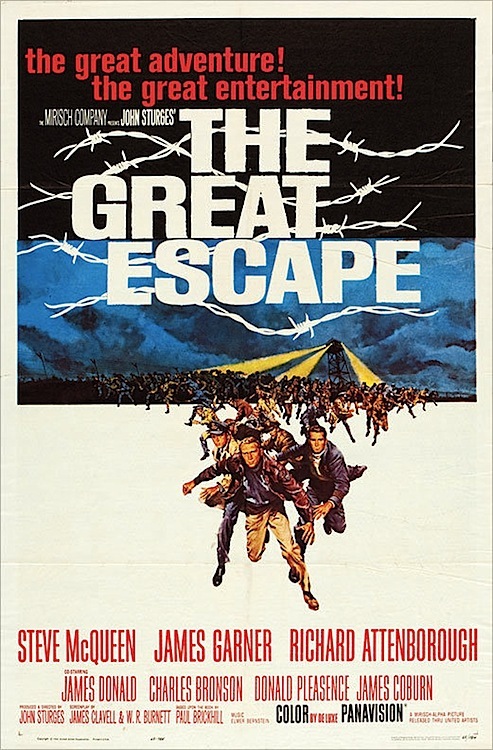 “The Great Escape” was shot in Germany in 1962 and released in 1963. It was McQueen’s big breakthrough as a star. Via Heritage Auctions. 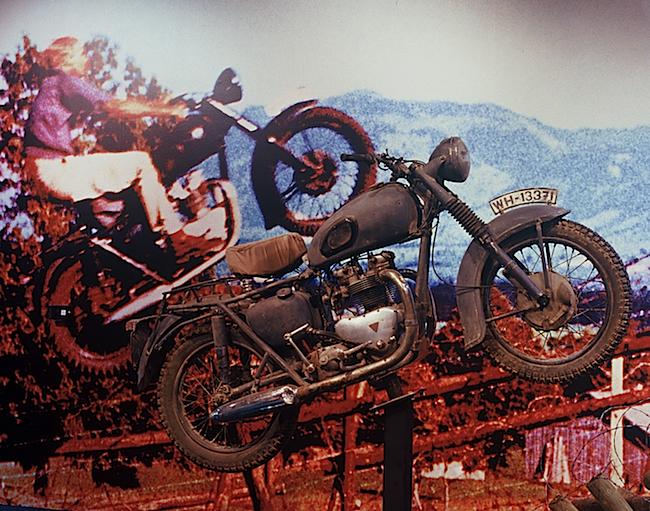 A 2006 exhibition at the Peterson Automotive Museum in Los Angeles featured a blowup of the famous motorcycle jump by Bud Ekins in “The Great Escape,” paired with a facsimile of the actual Triumph used in the movie. Ekins sold the original to a stuntman, and its whereabouts remain unknown. Photo by Matt Stone, from McQueen’s Motorcycles. The most famous scene in the film is the one near the end, in which McQueen’s character tries to jump a 60-foot barbed-wire fence. Ekins did the honors for that one, jumping a fence whose barbs were actually made out of rubber bands for the cyclist’s safety. As for the bike? “I sold it to a stuntman,” Bud Ekins told Stone. “I didn’t tell him it was the bike from ‘The Great Escape.’” The stuntman sold it, too, and the most famous motorcycle in cinema was quickly lost to the mists of history. In the years that followed, McQueen honed his cycling chops, at one point even riding with the Ekins brothers and three other pros as a member of the International Six Days Trial team in what was then East Germany. Again, Triumphs were pressed into service, and again, McQueen earned the respect of his motorhead peers. McQueen also continued riding in the desert, often under the pseudonym Harvey Mushman in an attempt to avoid needless attention. McQueen in his element in the parking lot of the Bud Ekins motorcycle dealership. The cast on his wrist puts this photo as circa 1964, just before he competed in the International Six Days Trial in what was then East Germany. Neile Adams McQueen collection, from McQueen’s Motorcycles. And, of course, McQueen made lots of movies, nine more alone in the 1960s after “The Great Escape.” Not coincidentally, some of these films—“Bullitt” from 1968 comes to mind—allowed McQueen to drive cars really really fast. That visceral thrill, as well as the actor’s insistence that he do most of his own stunts, is what made the chase scenes in McQueen’s movies feel so real. For McQueen, this willingness to put himself out there, as Dave Ekins puts it, ennobled the work of acting. It was also good for the box office, which is why by the early 1970s, the former reform-school kid was the highest paid actor in Hollywood. 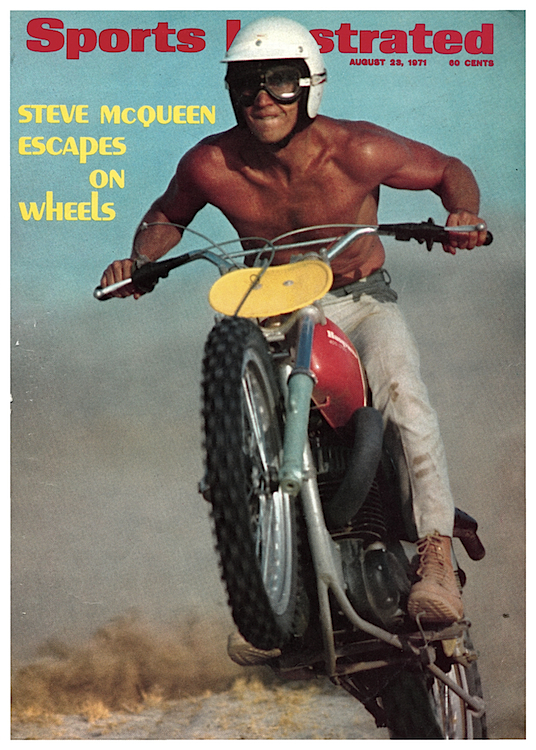 As this “Sports Illustrated” cover from 1971 shows, McQueen was in good shape into his 40s. Here he’s riding the Husqvarna 400 filmed in Bruce Brown’s documentary “On Any Sunday.” Via Sports Illustrated. 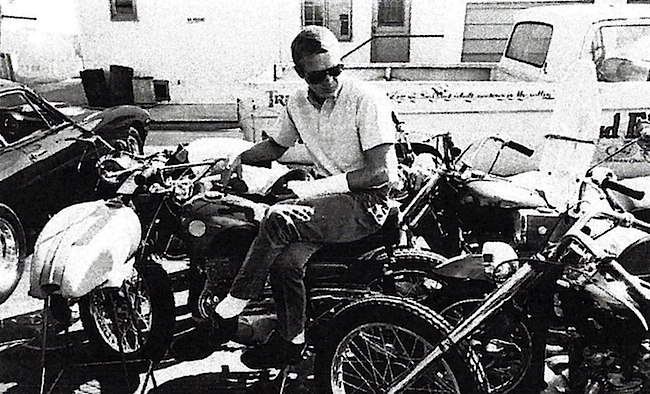 By 1971, McQueen’s passions for motorcycling and moviemaking would come together again in the form of a documentary called “On Any Sunday.” Directed by Bruce Brown, whose “Endless Summer” in 1966 had introduced general audiences to surfing, “On Any Sunday” did the same for motorcycle racing. Co-produced by McQueen, who also had an uncredited starring role, the film follows motorcycle-racing legends Mert Lawwill and Malcolm Smith. The documentary included McQueen’s 1970 run of the Elsinore Grand Prix, when the actor finished eighth in a field of 500—and with a broken foot, no less. It was also during the 1970s that McQueen’s reputation as a motorcycle collector grew, although author Matt Stone says the word “gatherer” better describes the more than 200 motorcycles that passed through his various garages over the decades. “I really doubt that Steve McQueen would have copped to the notion of being a collector,” Stone says. Still, McQueen’s Motorcycles is filled with images of vintage Harleys, Indians, Pierces, and Popes that ended up bringing top dollar at auction after his death, in no small part because McQueen once owned them. The great car and motorcycle customizer Von Dutch painted the wrong date on this 1929 Scott Super Squirrel. Before his death, McQueen gave the rare bike to Von Dutch as a gift. Via Antiquorum. Except when they didn’t. 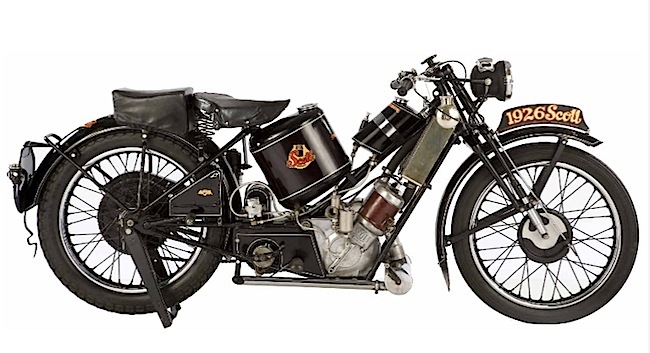 A case in point was McQueen’s rare, 1929 Scott Super Squirrel, hand painted by the great hot rod and motorcycle customizer Von Dutch. In terms of raw value, it was easily one of the top prizes in McQueen’s collection, but before his death, McQueen gave this museum piece to Von Dutch as a gift. McQueen’s life was filled with such acts of generosity—for him, a motorcycle could never be just a two-wheeled hedge against a traffic jam at the end of days. The Von Dutch anecdote also suggests that McQueen, who was comfortable riding familiar motorcycle brands fitted with factory engines, appreciated the work of a good customizer, too. That may have been true when it came to an innovator like Von Dutch, but Stone isn’t convinced McQueen would have looked kindly on today’s celebrity-driven, custom-motorcycle shops, as practiced by publicity-hungry enterprises like Orange County Choppers. “I don’t think McQueen would have bought into that scene at all,” Stone says. 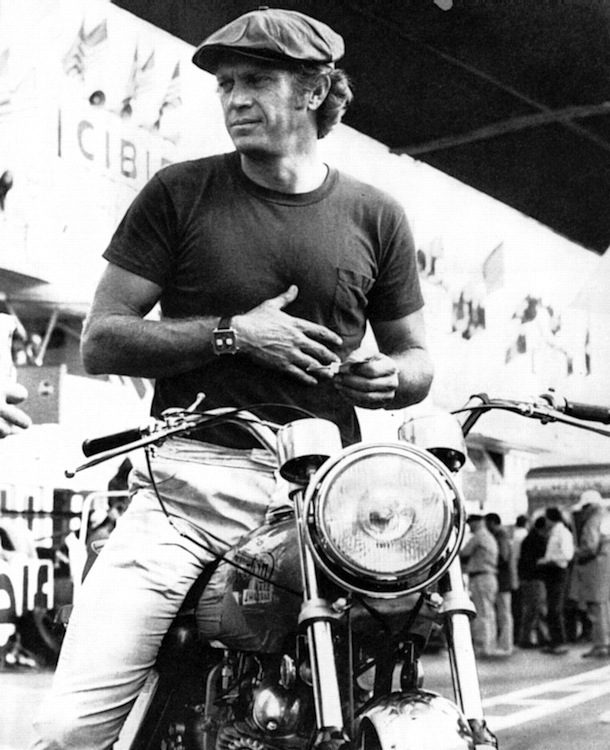 After all, for a guy like Steve McQueen, it was all about the joy of riding, preferably with friends. Calling attention to oneself with a fancy McQueen-branded bike just wouldn’t have been cool. “ ” From the invention of the carbonized filament light bulb, all these companies were working on a version that would last forever.